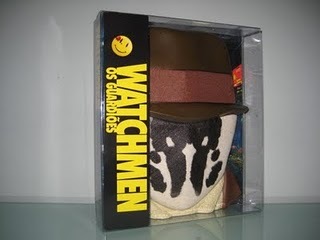 About the Packaging: The mask and hat band are cloth on top of the plastic frame/head. 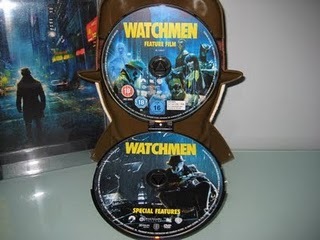 The 2 discs are placed in 2 disc trays at the back of the plastic head (as seen above). This costs around $40. 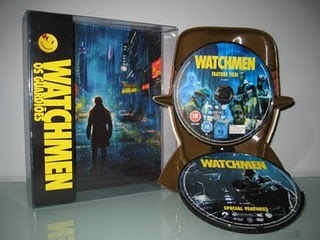 Love or hate: I personally find this DVD packaging tacky and unappealing. 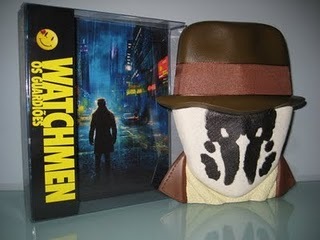 Considering that Watchmen is a hit graphic movie and that the big guys who did this have lots of money to spend on their packaging, they have no excuse. My only comment is this: you could have done better! 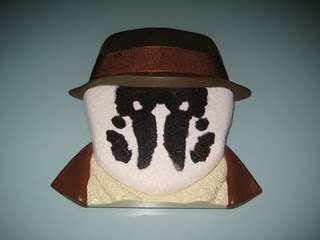 I mean seriously, just look at the ribbon on the hat. It’s just like the regular ribbon we see in bookstores. Meeeeh.